An old-fashioned tap and bucket, the preferred method of collecting sap, at Gould Farm in Monterey. Roughly 1,100 buckets hang from myriad sugar maples that punctuate the property; an additional 400 taps that feed into plastic lines with tubing complement the old-fashioned means of collecting sap. On a recent, blustery afternoon, Rausch and his work crew are poised to collect more sap to complement the roughly 7,500 gallons they’ve collected to date this season. 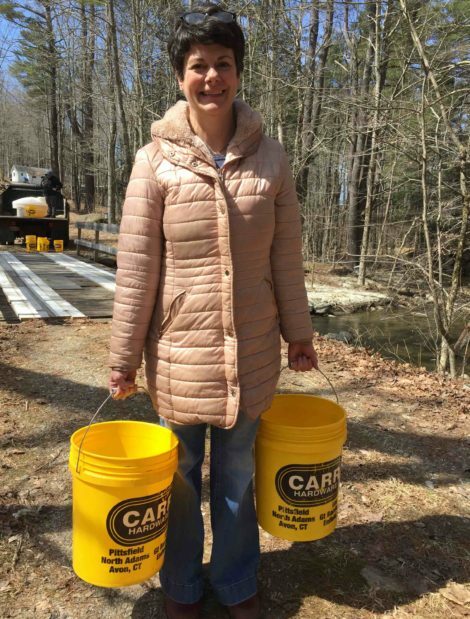 “The buckets are a joy to use for the work program and yield better production [than the newer methods]” Rausch declares as we duck down a dirt road toward the Sugarbush Loop. “People do enjoy collecting sap from the buckets they way it used to be done,” he adds. 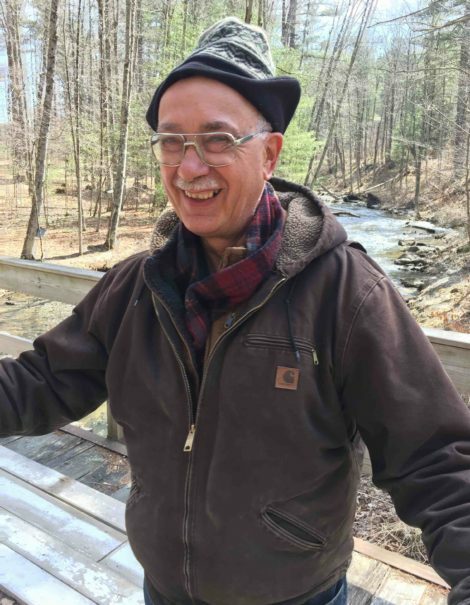 Rausch–who has been at Gould Farm since 1978– is at the helm of his own work crew, F&G (short for Forest and Grounds), who handle the bulk of the maple sugaring season. 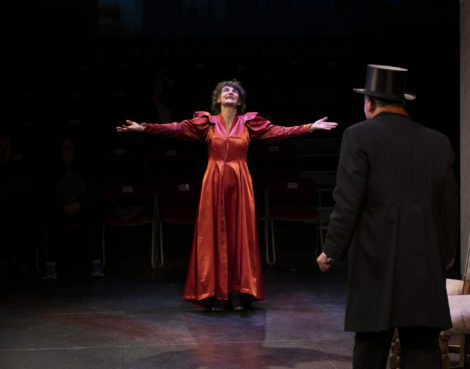 Each new guest (a term used to avoid stigma, one that has been in the language of Gould Farm since its inception), spends his/her first two weeks as part of F&G– “but not because it is elementary” one guest points out. Indeed, rather just the opposite. “It’s a great way to get to know the Farm,” says one volunteer. “We get out quite a lot,” she adds. And then the guest chimes in: “[Working outside] beats the winter blues–it’s cold, but a little extra sunshine comes with being on F&G.” After the first two weeks, guests are free to switch to another work group or do a split week between two or more. That said, sugaring season is very popular. Rausch enjoys teaching the trade, especially the task of tapping trees, and shares some practical advice: “Don’t go out when it’s 20 degrees and the sap isn’t running,” he cautions, citing the fact that those new to sugaring like to see the tangible rewards of their efforts: sweet, flowing sap. 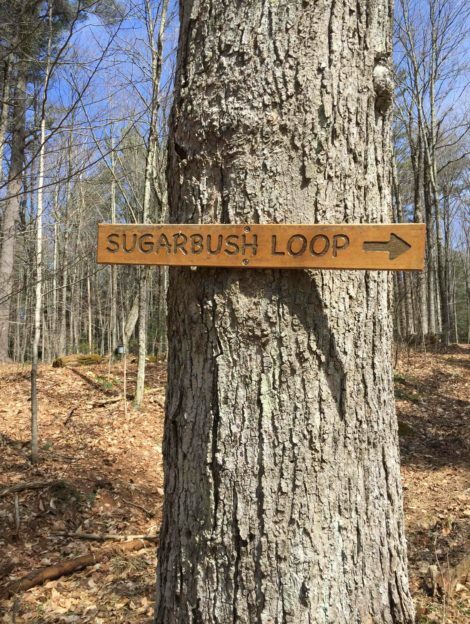 “This is one of the prime areas [for maple sugaring],” he says, “right here” he adds, gesturing to the many old sugar maples that dot the landscape. The sugar maple is one of the first trees in the forest to leaf out, and it is also one of the most sensitive– “this is not a city tree” Rausch points out, noting road salt and Asian long-horned beetles as prime assailants (although the latter is not found in this area). 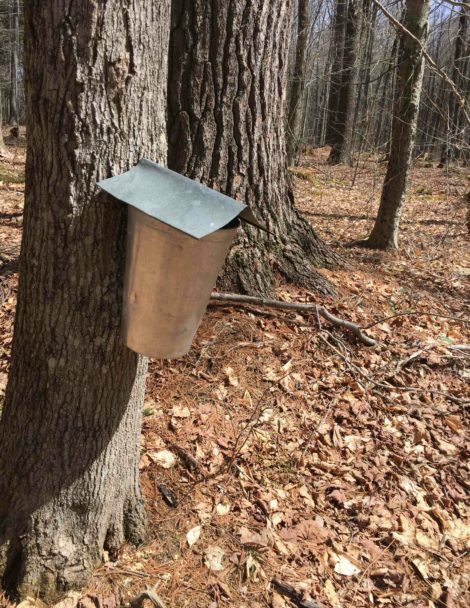 Maple sugaring is an unpredictable business at best; those familiar with the task know that it takes a whopping 40 gallons of sap to yield one gallon of amber colored syrup. At Gould Farm, where there is a long history of maple sugaring, records show they have produced anywhere from 400-1,200 quarts of maple syrup in any given season–which translates to between 100-300 gallons. Last year, Rausch reports the figure came in between 150-175 gallons. “It’s a collective effort,” according to Rausch, one that includes the tapping of trees, hanging of buckets and collecting of sap. 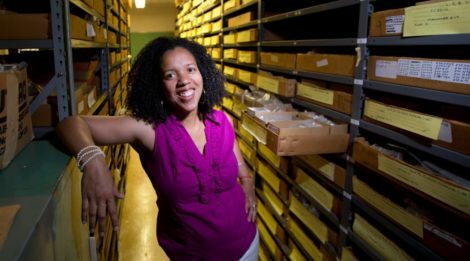 The work is slow, as the contents of metal collection buckets are dumped into 5-gallon plastic buckets and carried to the back of a pick-up truck where a 210 gallon tank waits to be filled. And this does not take into consideration the time required to turn the sap into syrup, a task undertaken in the sugarhouse by Steve Snyder, Work Program Coordinator at Gould Farm. In his 25 years at Gould Farm, Snyder has been at the helm of a giant wood-fired evaporator. This year, the process was hastened by a grant that allowed for the purchase of a reverse osmosis machine. The small model at Gould Farm circulates sap through three cylindrical membranes–powered by two motors–to remove water and retain the concentrated sap. 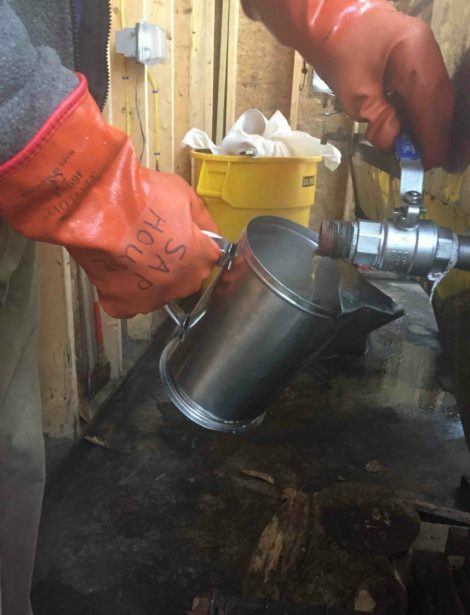 At the core of maple sugaring is the actual sugar concentration; as it flows from the tree, sap contains about 2 percent sugar; with the RO machine, the sap reaches about 8 percent sugar; the end product, maple syrup, is about 67 percentr sugar. 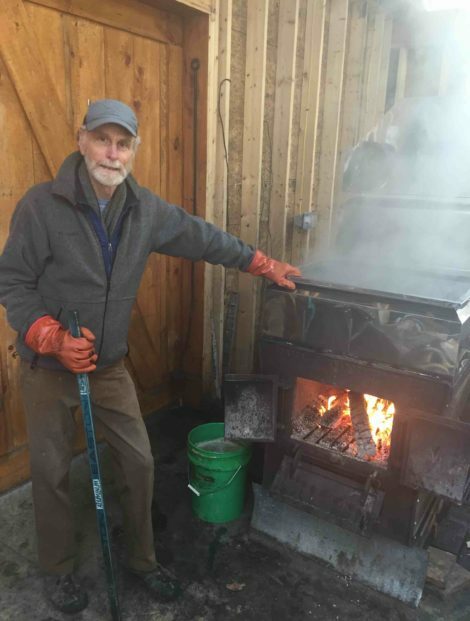 “This cuts way down on wood, time and heat [when compared with] the old system,” says Snyder–noting that he feeds close to two full cords of wood into his evaporator in the short sugaring season. As to how long the evaporation process takes? That all depends on the heat of the fire. “Running as hot as it can run–boiling at a gallon a minute–could yield 60 gallons [of syrup] per hour,” adds Snyder who–with a couple of colleagues–often camp out in the sugar house until the wee hours of the morning. Thankfully, the season is fleeting. “As soon as the buds get a little swollen, it ends the season,” says Rausch. 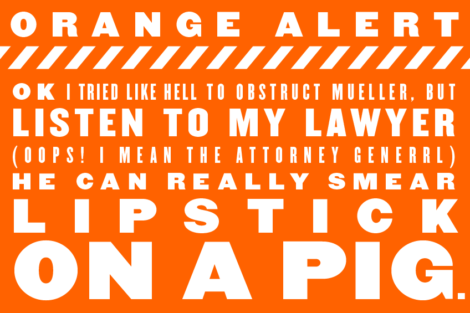 Which, this year, will likely happen in the next week or two. At that time, F&G will turn their attention to yet another task on the Farm, of which there are dozens. At the core of their work is carrying out MacKaye’s vision and protecting the hundreds of acres of forest woodlands with a sensitivity and respect for the forest that has garnered status as a Forest Stewards Guild Model Forest, one of only 26 in the nation–another sweet reward of working the land to yield its many gifts.